It can be challenging to find enough space to work out in a small home. 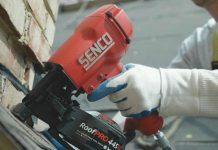 For those who have limited spaces, investing in the best compact exercise is the right option. It’s perfect for apartments, basements, and even the bedroom! The great thing about these models is that they don’t have to permanently be there. Some of them are foldable so you can put them away after use. 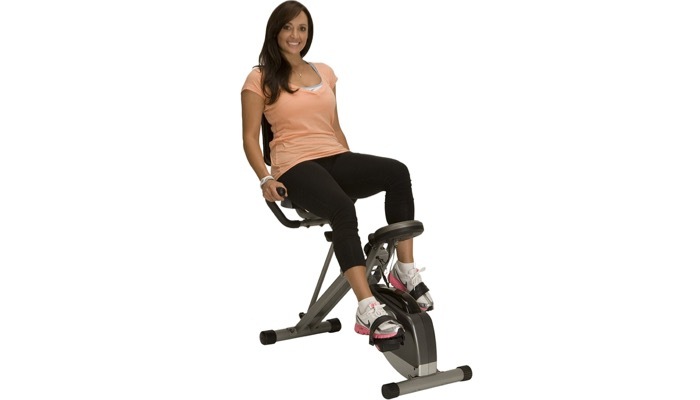 It’s a great alternative to those who can’t find space for an upright exercise bike or recumbent models. Still, build your muscles without cramming your house. Here are the best compact models that we’ve found that would be perfect for small spaces. We’ve found the Exerpeutic Folding Magnetic Upright Bike with Pulse to be the best choice in terms of features, quality, and value. This compact exercise bike is foldable so it’s not hard to store and free up space once you’re done with your workout. It’s designed with a comfortable seat so you can focus on really getting your muscles worked out. The great thing about this compact unit is that it also includes a heart rate monitor via your hand pulse. You can easily track and see if you’re hitting your target heart rate. The base has wheels so you can easily transport it from one part of your house to another. It has 8 levels of tension resistance that you can adjust to give you the ultimate workout. The unit with the next best features and quality is the Exerpeutic Folding Recumbent Bike. It’s a recumbent type with a quiet v-belt double-drive transmission system. 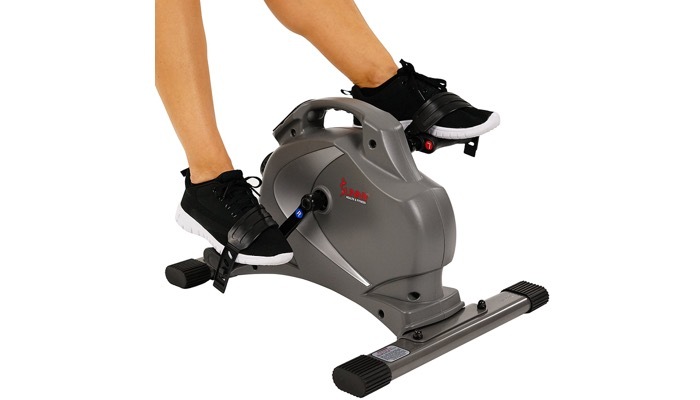 This compact exercise bike features a flywheel with balanced precision so you get just the right amount of tension in your legs. 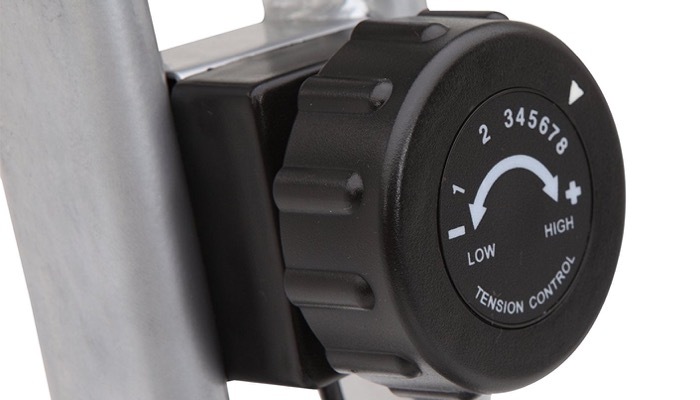 It offers 8 tension levels with its magnetic control system. This unit is suitable for people up to 300 pounds. A great extra feature is the LED display which lets you easily see your distance, time, speed, and even your calories and heart rate. Stay on top of your progress and immediately see if you are reaching your targets. The design allows for easy entry and exit and includes a comfortable backrest. 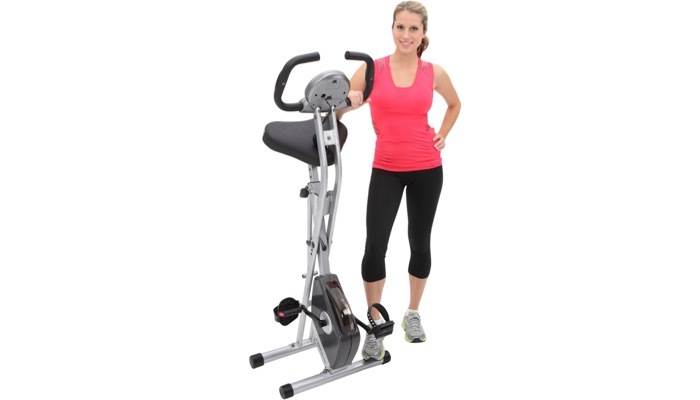 For those who want to focus on their cardio and strength training, the Marcy Foldable Exercise Bike with Adjustable Resistance for Cardio Workout and Strength Training is the best choice. This is the perfect equipment if you want serious fat blasting. The pedals target your quads and hamstrings so it also strengthens your muscles while toning your legs. This compact exercise bike features adjustable resistance so you can start low and work your way up so it’s great for beginners. You can choose from various degrees of exercises. Choose from up to 8 levels of magnetic resistance control. It’s foldable so you can easily put it away when not in use, saving you a lot of space. If you’re not really willing to spend a significant amount of money but still want something simple that works, the Sunny Health & Fitness Magnetic Mini Exercise Bike, Gray is for you. It’s a mini magnetic stationary bike that still includes lots of great features. You would need your own chair but everything you need for the workout is there. 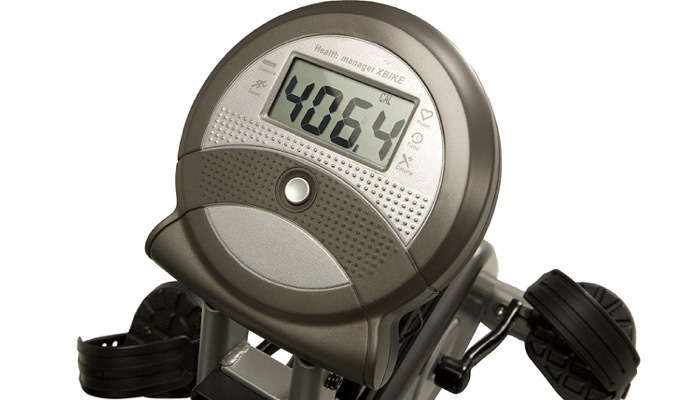 This compact exercise bike has an LCD display despite its significantly small size. It shows you your time, speed, distance, as well as your calories burned. The pedal has straps and the great thing is you can use them both with your feet and hands. 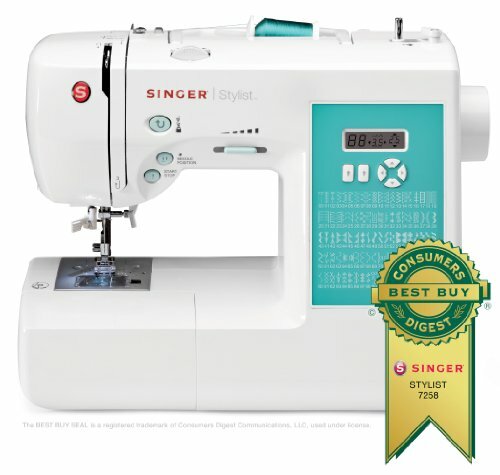 It’s quite a versatile machine at a fraction of the price! Whether you want the traditional upright exercise bike or other variations, there is a compact model equivalent to that these days. What matters is choosing the ones with the right features for the things that you want to achieve. If it’s cardio you want or building strength or muscles, this guide will help you pick your next compact exercise bike. Perhaps, the most important thing you need to check is the bike’s resistance. This matters a lot because it would determine how much workout you would get and it’s best that it’s adjustable. 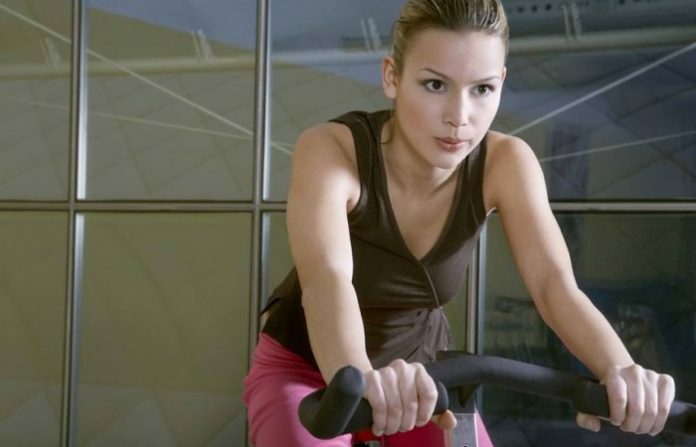 If you’re new to exercise bikes, it’s really important that your unit features different levels of resistance so you can work your way up as you get stronger. 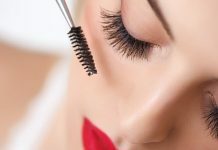 Make sure that the machine is easy to adjust and offers electronic or magnetic resistance control. These bikes have many moving parts so you have to make sure that the design is sturdy and that they will stay in place even after many uses. If possible, choose a bike that has a safety lock, especially if there are kids in your home. It’s useless to work out if you can’t track your progress. Look for a clear LCD display that’s easy to read. It’s important that it shows you vital information about your heart rate, speed, and calories. There may be other data that could be useful depending on your goals. Different units come with different types of heart rate monitors. It’s still best to choose one that comes with a chest strap since it’s the most accurate. But because of its compact design, most of these units will have contact monitors on the hand. That still works but make sure that it’s accurate. Some machines also offer programs that let you adjust and customize your routines. This is best for advanced users who already know what they want to achieve and how they’re going to design their workouts. As with any exercise equipment, choosing the right compact exercise bike would greatly depend on your fitness goals and unique health conditions. We’ve found that the Exerpeutic Folding Magnetic Upright Bike with Pulse offers the most useful features and the sturdiest design but all of the featured models above are great options depending on your budget.